Perfect for Hunter-Jumper Riders! Bring home a little Spring all Year Round! Looks stunning behind black SUV! Category: Master Series, Comfort. Tags: Up to 17hh. It’s so Easy Being Green! Bring a little Spring home every day! Every horse and rider combination is unique! So why not your trailer too? 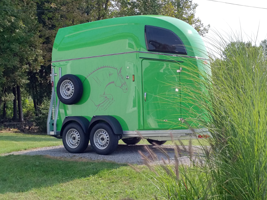 Comfort trailers are a wonderful trailer for horses loving a quiet bright ride. 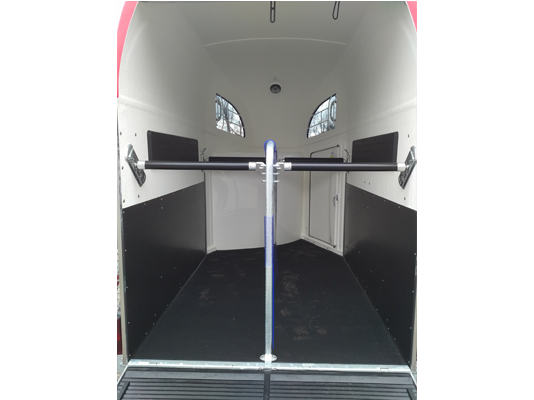 You regulate the airflow in the trailer after setting the stall bars to be the most comfortable “seat-belt” for your horse. Hang your hay net/bag and load your horses from the rear ramp. Even on a rainy day, treads on the rear ramp prevent you or your horse from slipping. This unit is ready to hitch and go behind your SUV! The Comfort offers your horse comfort! An excellent trailer for horses up to 17hh, the Comfort allows you to adjust stall length and chest bar height to accommodate small and tall horses. Ample room ahead of the chest bar, your horse can look out the tinted pop-out windows with access to hay hanging from a ring in the ceiling or from a “table” in front of them. The 5′ entry ramp has less of an angle than other trailers in the market, making it an easy entry for your horses. Integrated rubber treading keeps everyone safe loading in inclement weather. A tack cupboard offers lots of room for 2 English saddles, bags, blankets, bridles and boots! Your horses stand in comfort on the rubber mat that is glued to the floor and sealed at the wall edges, keeping moisture and mold from growing underneath. 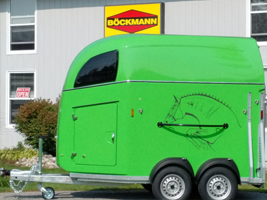 The Comfort is the sleek model of Böckmann’s “small” trailers. The reinforced polyester superstructure is a product also used in the racing yacht industry because it is light in weight yet hardy! An aluminum floor means no worry of floor rot! the Galvanized steel chassis will weather Canada’s worst winters and hottest summers. The polyester roof reflects the summer sun’s heat, keeping the interior cooler relative to the summer temperatures. 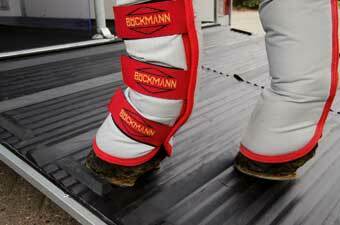 Every Böckmann 2 horse trailer has a 5′ rear entry ramp covered with their patented integrated rubber treading. External stall bar release points keep you safe when dealing with emergencies inside the trailer. 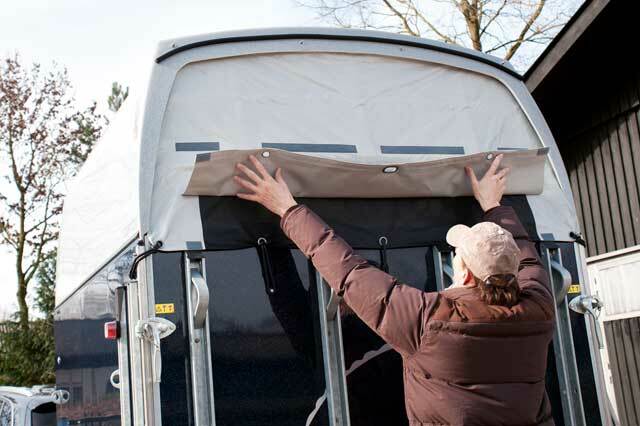 Two tinted pop-out windows protect your horses’ eyes and reduce the sun’s glare during transit. Comfort trailers have independent torsion suspension with an additional shock providing your horse with a comfortable ride. This unit is BRIGHT GREEN ** PRP Body & Polyester Roof, with a stunning Large Jumper decor and External Tie Bar/Saddle Rack. Internal Height: 7’6″, Two 31″ wide stalls, Total Trailer Length 14’9″. Saddle Chest with 2 telescopic English Saddle racks + Kit (Mirror, net, broom & shovel), 1 shelf, blanket rack, multiple hooks.